You’re using your Japan Rail Pass to tour Japan. You depart your train in a new town, and you want to see some of the sights before settling into your next location. What, though, will you do with all of that luggage? Fortunately for you, Japan has the solutions for just such a travel dilemma. International travelers may be unfamiliar with the luggage forwarding services and coin-operated lockers available in many places throughout Japan. Consider the following travel tips to make your stay in this beautiful country easy and hassle free. 3 Luggage forwarding or coin lockers: Which should you choose? Luggage forwarding is a type of delivery service. 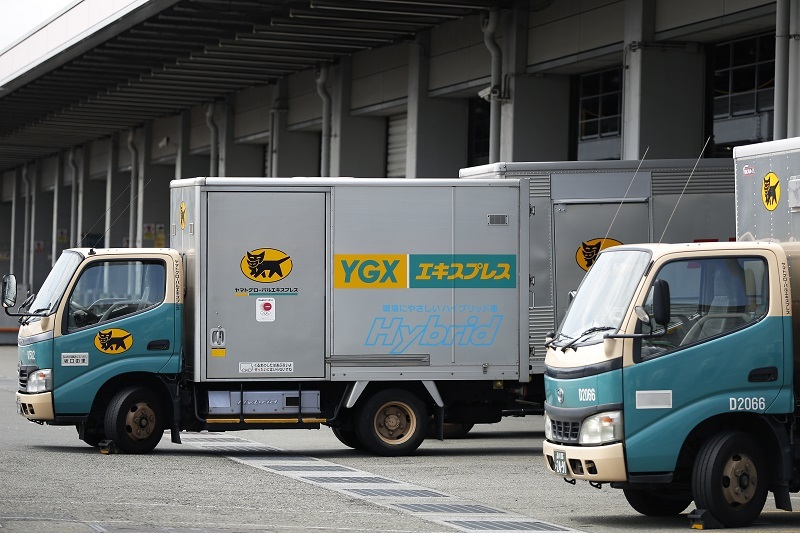 Instead of carrying your luggage with you on public transportation or shinkansen trains you can often have it delivered directly to your destination. Many airports have Takuhaibin luggage delivery counters (also called Takkyubin, which is actually a registered trademark). No prior reservation is required for transporting luggage – only your contact information, that of your hotel, and payment. Make sure to have essential supplies, such as a change of clothes and toiletries, packed in a small bag you are not having delivered. Baggage delivery may arrive the same day – if staying near the airport, bags typically arrive by 5 PM – but sometimes takes longer. When you arrive at your hotel, present your luggage receipt to the desk attendant. If having your luggage delivered to the airport for your return trip, keep in mind that it should be sent to the airport no less than two days before your expected departure. Airport luggage forwarding often costs between ¥1,500 and ¥3,000. When traveling by train, you may stop at several attractions before reaching your final destination. Also, during busy travel times, the train’s luggage storage area may not have enough room. In this case, you may want to have your luggage forwarded to where you are staying. To use these Takkyubin luggage services, you may call ahead, make reservations on the internet, or visit a convenience store – either inside the train station or one of several dedicated delivery companies, such as Kuroneko Yamato, Sagawa Express, or Nittsu. Baggage service counters may also be found in shopping malls or supermarkets. Locations offering Takkyubin service are indicated by the symbol of a yellow oval behind a black catt carrying a kitten. If departing from a hotel, you can have the staff make luggage forwarding arrangements for you. When purchasing baggage forwarding services, you can specify the date, time, and location to which you’d like to have your bags delivered. Just as at the airport, you will also need to have your contact information and a payment method handy. Luggage can be held for up to seven days prior to delivery. Depending on the size of your baggage, these transport services usually range between ¥1,000 and ¥5,000 in price, per item. For example, next day delivery of luggage from Tokyo to Kyoto may cost around ¥1,900. Travel tip: Before leaving home, print out the name and address of each hotel you will be using in both English and Japanese. When requesting luggage forwarding services, simply present your printout to the attendant. Airports and train stations are equipped with automatic, coin-operated left luggage lockers. The lockers differ in size, so you can find one to meet the needs of your baggage storage. The largest lockers usually have dimensions of 117 centimeters by 57 centimeters by 43 centimeters. How to use coin lockers in Japan? They are rented for the day, from the time of rental until midnight, although some can store your suitcase or backpack for up to 3 days. Costs for lockers range between ¥300 and ¥700 per day. 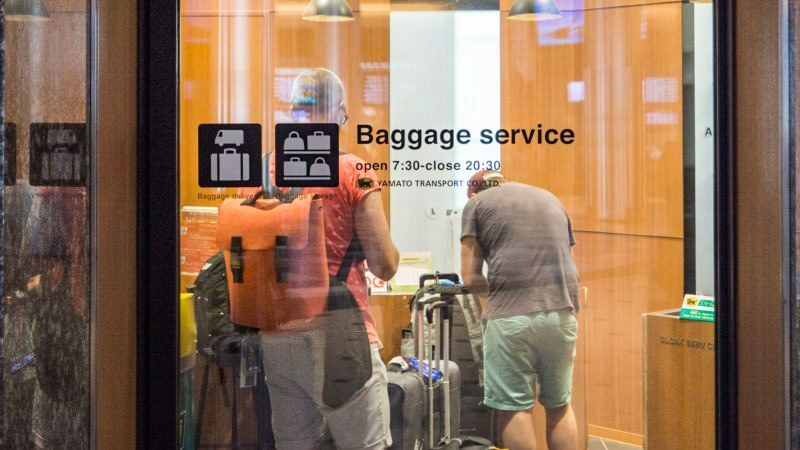 In case your baggage will not fit in even the large lockers, many stations also have left luggage services, where baggage is left with the staff rather than in a locker. These services may cost between ¥500 and ¥1,000. 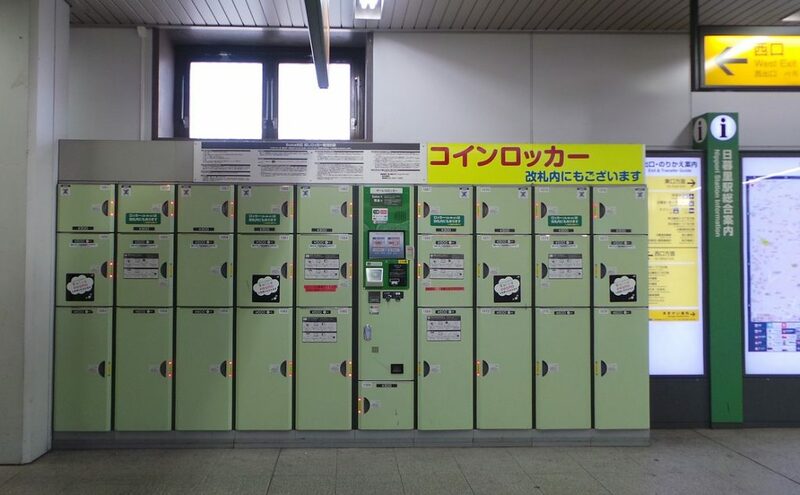 Some attractions, such as onsen, museums, and department stores may also offer coin-operated lockers. Keep in mind, though, that these are generally intended for smaller items, such as purses, camera bags, or shopping bags. Large luggage may not fit in these coin lockers. Luggage forwarding or coin lockers: Which should you choose? The option you choose will likely depend upon your unique needs. If you need to store your baggage for a short time and retrieve it same-day, lockers are ideal. Forwarding is an excellent service, but if you are staying at a private residence – such as those available through AirBnB – it is less advisable, as you will have to be at your accommodations to receive your bags. With a four-hour delivery window, this can cut into your vacation time. In these circumstances, coin lockers could be a better option. On the contrary, for a large group of people with large suitcases, luggage forwarding may be the best option. What if you have forgotten a luggage item in a locker, on a train, at a station, or the airport? Do not despair, as theft is rare in Japan. Simply contact the company. If the item was found, it can be retrieved from the station’s lost property office. With your newfound understanding of Japan’s coin locker and luggage forwarding services, you are now prepared to make your Japanese vacation the trip of a lifetime. Hi there – quick question, do you happen to know if these services are able to ship luggage to non-hotel addresses (e.g. an office, or an apartment)? Hi Jake! Our recommendation is to contact directly the company whose services you want to use – they will be able to provide concrete details. Happy travels! I will be traveling between Shinjuku to Osaka in late August. I won’t be staying at a hotel, I will be staying at an AIRbnb Location in both city’s. Can I send my luggage from and to the train station in both cities and if not what other options is there. Thanks. I am arriving by cruise ship in Yokohama and I need to have my luggage sent to Narita by the delivery system and then stored by the storage system from April 14 to May 5 is this possible ? Please let me know what to do. I will fly from Narita home on May 5. Thank you. We will be travelling to Japan in July and will be flying into Tokyo and then taking the train to Osaka or either Kyoto, my schedule is still being finalized. I’ve read that you cannot take luggage on these trains and my concern is the luggage handling on the high speed trains especially since we will be landing in Tokyo and then taking the train to Osaka the same day, how is this handled and is there any way we can take our luggage on the high speed train to Osaka ? We will also be travelling around the country from Osaka / Kyoto to Hiroshima to Takayama and busing to Kanazama and then returning to Tokyo by high speed train. How are tourists expected to transport their luggage when they may only be staying in a destination for one night ? If the hotel handles this for you when does the luggage arrive at your destination ? Also, if you have the Japan Rail Pass and are going to be in Japan for 3 weeks can you make seat reservations on all the trains you are going to use from one city to another over the course of your trip at one time ? Thank you. Should you need to take your luggage with you when travelling on Shinkansen trains (bullet trains), you are allowed luggage on board at no additional cost. However, there is a limitation of two pieces of luggage per passenger, both of which should have a maximum weight of 60kg and a total of 250 cm in height, length and width. Regarding seat reservations, Japan Rail Pass holders can book a seat on all JR trains free of charge. To reserve your seat, please go to any Ticket Office (Midori-no-madoguchi), located in all Japanese train stations. Alternatively, you can also book your seet at a the ticket counters located in a Travel Service Center or a Travel Agency ticket sales office. State your destination and preferred departure time and let the staff member find the best option for your trip. You can reserve seats on all trains you are going to take in the following 3 weeks at the same time. Hi, can I use the coin lockers to keep my suitcase for two nights / three days? Thank you. As specified in this article, coin lockers are rented for the day, from the time of rental until midnight. Good evening. I will be travelling to Japan in January and i was hoping to forward my luggage from Toyko to Kyoto. i am looking at leaving the luggage in Tokyo on the 5th January and picking up from Kyoto on the 7th January. I will not be staying in a hotel but at Airbnb accommodation, so i was wondering if this is possible please. To make sure you have the correct information we recommend you to have this checked with the luggage delivery company you choose (there are many, for example Kuroneko Yamato, Sagawa Express, or Nittsu) and also with your Airbnb host.